The Lightning Hoods are the masterminds behind the whole war, as they weren't particularly happy about the fact that the SE admiralty decided that the TG should be their friends instead of letting the scientists dissect the for science. So in one clever swoop the newly-formed Hoods sicced the WF on their old masters and escaped to Orhurst to form their own nation, taking all manner of cool technological advances with them. The LH are still as LH as ever, being lightning fast glass cannons with a lot of lasers and other high-end stuff. They're also the only faction with true hovercrafts (TG can use hovermechas though) so if you've always wanted to build your own dediblade laser-spewing monstrosity you should be right at home here. I had the idea of a VTOL gatherer —like those Terran thingies in Starcraft. Made a scaled down prototype, but the concept turned out garbage in battle so I'll just leave this BP here. I have an original idea for the LH wild slot. 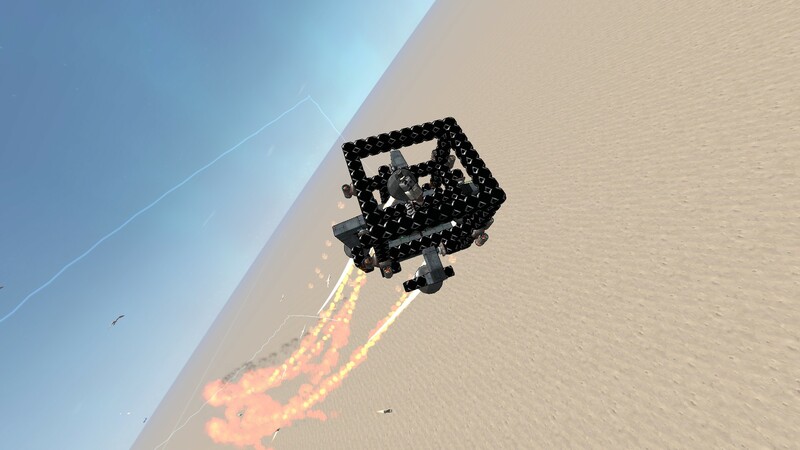 A laser defense turret that "jumps" whenever danger is close. I have made a mock-up of the frame as a proof of concept. Basically, it's the same technology that animate WF vector thrusting zealot ships, but reversed to move the ship away from the enemy. For now it only react to incoming missiles, but it merely requires more ACB's to respond to other threats like ram attacks. It still needs some tweaks but I am sure it's workable. What you think? Should I go ahead with that? Ok. After my disastrous 3 attempts of creating a hovermech I am now going to attempt creating an LH tank. I feel like 1Q laser with a lot of storage cavities can be true devastation. I have only two questions: how big can it be and fast can I make it go? Still 10k volume right? Would a close range hover-tank orbiter with a rapid fire PAC work? @ARC 2k as per usual, as were talking about a regular design. You can make it as fast as you want. @MISD I'm... Somewhat certain somebody asked to build something like that already a month or two ago? The answer is yes, anyhow. What exactly is a "wild" hovercraft? Curious because I've been looking for something that still needs to be made. (2016-10-14, 04:50 AM)AlexJM Wrote: [ -> ] What exactly is a "wild" hovercraft? Curious because I've been looking for something that still needs to be made. Something that is just crazy, really weird weapon set ups or the thing looks different. One idea that was discussed for the Wild slot that never got finished was a spider bot. Can it break with the LH norm of speed/light armor if it's a wild vehicle? Like something heavier and more well armored? It can, but the hard part is, something about it still has to feel like it belongs in LH (other than is using lasers) it has to have visual ques that tie it together.